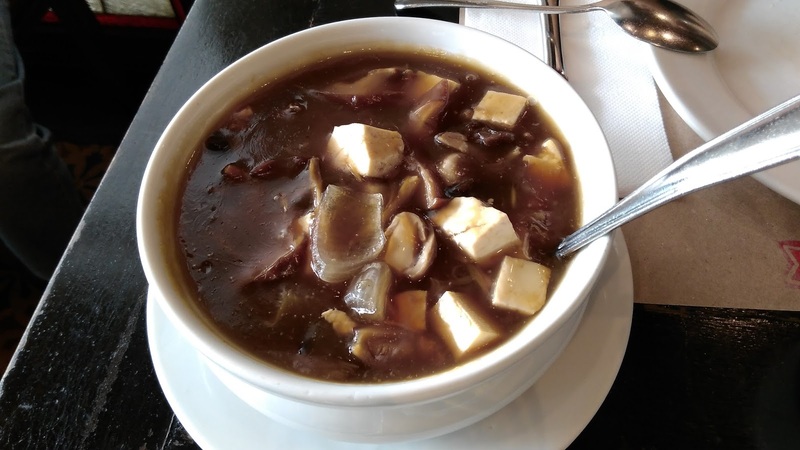 Eating healthy in the city is sometimes a challenge because most restaurants do not offer vegan or vegetarian options on their menu. When my friends and I decided to meet up, I requested that we go to a place with meatless options so we decided to try Kanin Club at UP Ayala Technohub, Diliman. One of my favorite dishes at Kanin Club. Thai Green Mango Salad. Our resto of choice did not disappoint. I checked their menu online so I knew what options I had and I decided on a few that I wanted to try out. Luckily, my friends were supportive. They tried the no meat dishes as well and enjoyed them. 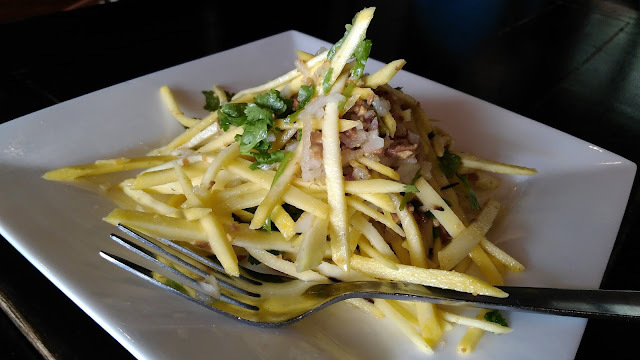 The first thing we ordered was their Thai Green Mango Salad (Php190) which was described in their menu as follows: "slivered green mangoes, onion, cilantro & peanuts, sprinkled with a sweet-salty mix. A salivating experience." Indeed, it was a salivating experience and I couldn't get enough of it. The green mangoes and the peanuts were an interesting combo. Together with the crunch of the fresh onions; it made me want to eat some more. This is definitely one of my favorite dishes in the menu. Our next dish was Kanin Club's Vegetarian Delight (Php290) which the menu describes as consisting of: "banana blossoms, 3 kinds of mushrooms, and tofu, sauteed in vegetarian oyster sauce. It might just convince you to turn vegetarian." I certainly didn't need convincing and my friends found this satisfying too. This would be a good dish to start your lunch or dinner if you are not into salads as it fills you up so you don't binge out on the next course. It's a hearty dish to warm the tummy with that umami taste we all crave for. This was especially satisfying for me as it had 2 of my favorite ingredients: mushrooms and tofu. 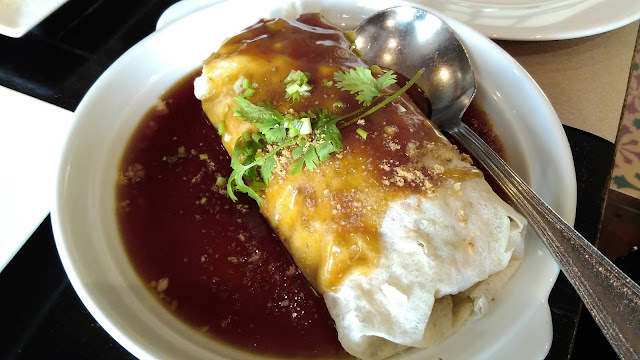 A surprising item on the menu was their Lumpiang Sariwa (Php110) which consisted of: "spring rolls filled with slivers of carrots, tofu, bean sprouts & roasted peanuts with a sweet soy, peanut garlic sauce." Lumpiang Sariwa on Kanin Club's menu. This is a popular dish so we have tasted this dish in other restos as well with Max's Restaurant coming into mind. Kanin Club's version was less sweet and more peanut-y with the hint of garlic still present in the sauce. We also loved that the slivers of ingredients were small enough to scoop properly with a spoon along with the sauce when we divided the lumpia. With other versions, the slivers of carrots and other ingredients are usually too long to divide properly and they end up falling to your plate when you scoop them with a spoon. They are also too thin to handle with a fork. We remember this to be the case with Max's version and their sauce was sweeter too. So we actually enjoyed Kanin Club's version more. All three dishes were good for sharing between 2-3 persons and they are really filling so you might not even need to order rice or additional dishes. From these 3 items, I highly recommend trying out the Thai Green Mango Salad and their Lumpiang Sariwa which I will be coming back for soon.